5G is the next generation of mobile networking technology following 4G. Much like every generation before it, 5G aims to make mobile communication faster and more reliable as more and more devices go online. Unlike in the past, when mobile networks only needed to support cell phones that were just for browsing the web and text messaging, we now have all sorts of bandwidth-demanding devices like our HD-streaming smartphones, smart watches with data plans, always-on security cameras, self-driving and internet-connected cars, and other promising devices like health sensors and untethered AR and VR hardware. As billions more devices connect to the web, the entire infrastructure needs to accommodate the traffic to not only support faster connections but also better handle simultaneous ones and provide broader coverage for these devices. This is what 5G is all about. How Is 5G Different From the Other “Gs”? 5G is simply the next numbered generation following 4G, which replaced all the older technologies. When Will 5G Come Out? The time frame for 5G service availability depends not only on where you live but also which service providers are available in your area. Right now, 5G is available in only a few locations, so not just anybody can sign up for service. Verizon and AT&T are the only companies that provide 5G to customers in the United States: Verizon has a mobile 5G service and fixed wireless access service, and AT&T offers mobile 5G. 5G phones are also an important component of this new fifth-generation cellular network because not just any phone can work with a 5G network. Phones and other devices that run on 5G networks are set to come out this year. See When Is 5G Coming to the US? for more information, or 5G Availability Around the World if you're not in the US. Internet service providers, mobile network operators, and other companies are constantly coming out with new 5G trials and other announcements as 5G rolls out around the world. April 18: Huawei promises to create a $600 5G phone. April 17: Swisscom's 5G network goes live across 102 locations. What Will 5G Be Used For? This might seem obvious given how ubiquitous smartphones are, but while phones are definitely a major player in mobile communication, they certainly aren't the only focus in a 5G network. As you’ll see below, the key components with 5G are ultrafast connections and minimal delays. While this is, of course, great for anyone streaming videos from their phone, it’s more important in scenarios where minimizing delays is really important, like with the future of interconnected devices. One application might be augmented reality devices or virtual reality headsets. These devices require a tremendous amount of bandwidth and need to communicate over the internet as quickly as possible to provide their intended effects. Any latency at all can drastically impact how "real" things feel in those virtual environments. The same applies to any other devices that need to respond quickly, like autonomous cars to avoid sudden collisions and understand proper turn-by-turn directions, remotely operated hardware, and robotic systems that learn or abide by remote controllers. That said, 5G is still paving the way for smoother connectivity from our everyday devices, too, like when gaming, making video calls, streaming movies, downloading files, sharing HD and 4K media, receiving real-time traffic updates, vlogging, etc. 5G is so fast that it won't just be available for mobile devices. It has the potential to completely replace your high-speed wired connection via fixed wireless access! See our 5G Internet: The High-Speed Replacement for Cable article for more on this. 5G Will Change Everything... No, Really! Like other wireless communication methods, 5G sends and receives data in the radio spectrum. However, unlike what we're used to with 4G, 5G uses higher frequencies (millimeter waves) on the radio spectrum to achieve ultrafast speeds. The downside of using high frequencies to transmit data is that these frequencies experience far more interference from things like trees and buildings, which means strategically-positioned small cell towers are required to push the network throughout a city. However, not every mobile network operators works the same way. Some companies make use of 5G on lower ends of the radio spectrum so that cell towers can reach broader areas and penetrate walls, but the trade-off is slower speeds. 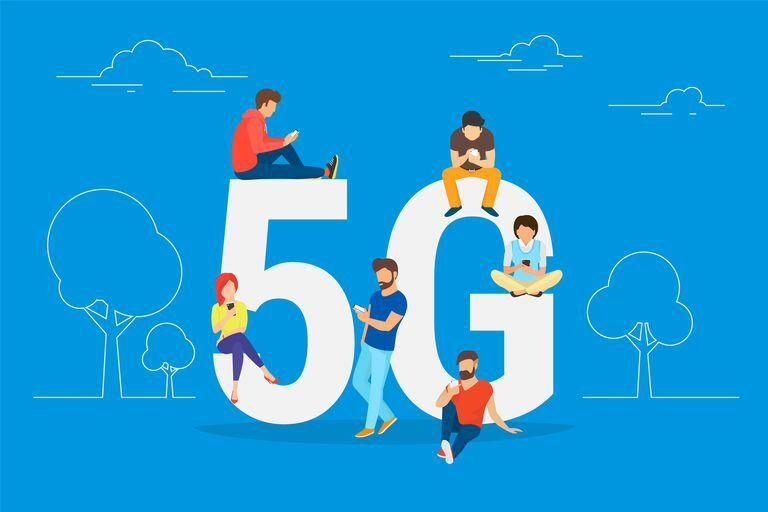 With 5G, everything related to mobile communication is faster, from the speed at which you can download and upload data to the number of devices that can connect to the internet at the same time. A 5G cell, which is what transmits and receives mobile data, supports speeds of at least 20 Gb/s for downloads and 10 Gb/s for uploads, with latency as low as 4 ms or more. However, in most situations, this might translate to real world speeds of 100 Mb/s (12.5 MB/s) and 50 Mb/s (6.25 MB/s), respectively, but could easily fluctuate up or down depending on a variety of circumstances. For comparison, the average mobile download speed is around 27 Mbps — over 3.5 times slower than what's proposed by 5G. As an example, in an ideal situation with 5G speeds as fast as 1 Gb/s, you could download a 3 GB movie to your phone in 24 seconds, or upload a 1 GB video to YouTube in just eight seconds. At a minimum, 5G must support 1 million devices for every square kilometer (0.386 square miles). This means that within that amount of space, a 5G network is capable of connecting a whopping 1 million or more devices to the internet at the same time. This type of scenario might seem hard to fathom considering cities with the highest population density (like Manila, Philippines, and Mumbai, India) "only" hold anywhere from 70,000 to 110,000 people for every square mile. However, 5G doesn’t need to support a mere one or two devices per person but also everyone’s smartwatch, all the vehicles in the area that might be connected to the internet, smart door knobs in nearby houses, and any other current or to-be-released device that needs to be on the network. It's predicted that, globally, there will be 1.3 billion connections on 5G networks by the end of 2023. 5G cells can communicate with all sorts of devices, like ones used by a stationary person who isn’t moving to someone in a high-speed vehicle like a train, who’s traveling up to 500 kmh (310 mph). It’s possible that different areas will require a different mobile base station to accommodate for varying speeds. For example, a small city that only has users traveling by car and foot might not have the same base stations that a larger city with a high-speed public transport system might. 5G and other mobile broadband standards are set by the 3rd Generation Partnership Project (3GPP). 3GPP Release 16 is "phase 2" of the 5G project, and will be finalized by March 2020. For a much more technical reading of the 5G specs, see this Microsoft Word document from the International Telecommunication Union (ITU). Once 5G is widely available, it's possible that it will be the last major advancement in mobile networking. Instead of a 6G or 7G later on, we might simply stick with 5G but get incremental improvements over time. It's easy to confuse 5G with 5 GHz Wi-Fi, but the two are not the same. The former is a mobile networking technology while the latter is a frequency band used in some Wi-Fi routers. What Is the aptX Bluetooth Codec and Why Do Some Devices Use It?